Tyson Foods’ CEO Tom Hayes sees a bright future for the company, especially after it exceeded expectations for 2017. "We delivered well over our goals of at least four percent operating income growth, EPS growth in the high single digits and three percent volume growth in value-added products, and expect to meet or exceed these goals again in fiscal 2018," said Hayes. Well, Tyson Foods is setting an example, alright! The company has proved to be in tune with consumer trends. 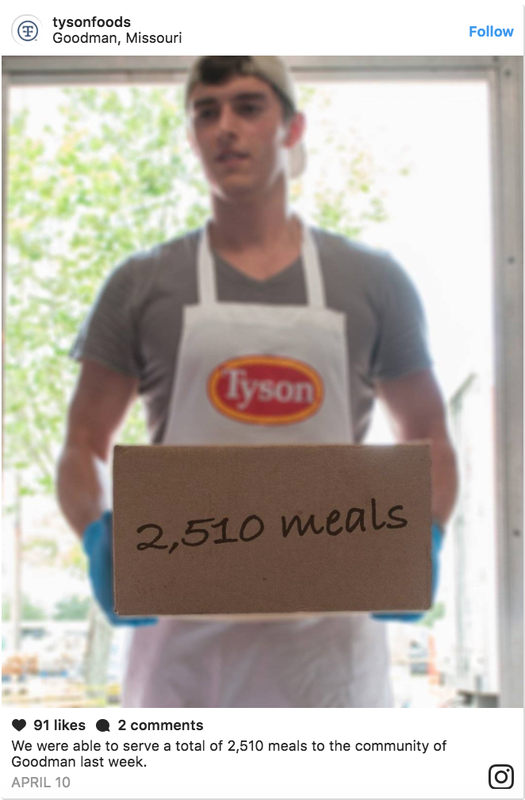 For example, Tyson has seen record sales for their Open Prairie Natural brand of fresh meals as they see customer demand growing double digits for No Antibiotics Ever (NAE) and no-added hormones natural fresh meats. “Gatekeepers within the customer are asking continuously to be NAE. We're fully NAE now, and we're actually buying meat on the outside that's NAE. The cost [is] a little bit more on the upfront and we've been able to swallow that cost and then remove that cost," Hayes told analyst Farha Aslam at Stephens who asked about the reason behind the launch of NAE products. Another trend that Tyson has invested in is alternative protein. The company bought into Beyond Meat with a five percent stake in the vegan business, surprising many as the big food company tests the waters of this fast-growing segment of the protein market. Speaking of meat, even though Tyson’s 39 percent sales come from beef as the leading protein, the majority of the company’s sales come from leaner meat with chicken accounting for 30 percent of sales and pork accounting for 14 percent. This is a good sign for the company since there is a trend of consumers moving away from red meat. A fourth area that is expected to grow in volumes is the prepared foods market. In the financial year 2018 the segment is expected to grow around 10 percent, boosted by the AdvancedPierre Foods deal, struck earlier this year by over four billion dollars. Analysts covering Tyson at Morgan Stanley believe the company looks well set for a solid 12 months, writing in a note to clients on Monday: "Tyson appears well positioned to achieve another record year." The culinary arts program at Northside started humbly in a small, little building, according to district architect Gary R. Griffith. As it expanded, both in student body and mission, the space needed to expand along with it. "It was quite a sight to come out to Northside High School and see the program they were able to run very successfully out of some portable buildings," Eric Horstman, principal of Corgan Architecture, said. "They literally were using portable buildings with hot plates to run their entire program. So, I brought in Lance and his team into the project very early so they could be involved." FCSI consultant Lance Brooks was on top of industry trends and ready to face the challenges that came with recreating the space. And his greatest inspiration for the remodel? Forth Worth ISD's Career and Tech Education Coordinator, Chef Timothy Kelly. The chef came into the design with a unique angle: his students. He was talking about five-star restaurants, about the kids being prepared to work in every environment, and using the best of the best to acclimate them into the real world. His goals were to provide a culinary arts experience with different venues and cater to the students, whether they were training for casual or fine dining. "Whenever we design a kitchen, we want to build in flexibility. We understand that after they are built, they are hard to adjust," Brooks said. The space had to be a chameleon. It had to be fluid, transforming from holding a minimum of 144 students to 263. The questions were endless: Did it have to have one or two kitchens? How many classrooms? How much square footage? How many venues and restaurants? To answer this, Brooks had several solutions. First, he put on tables on casters, allowing staff to move them and to shape the classrooms as needed. He also considered the surface flooring, choosing material that would be easy to clean and quiet for a better learning environment. Retractable cord wheels also lined the ceilings so students could use their equipment from different parts of the room. Also, a video system was placed, which would follow the chef or teacher and showcase their movements on a projector for more visibility during lessons. The team members, with their vast, collected industry experience, also collaborated on the best equipment for the culinary program. Their proudest selection? Their hood system that was low-volume to keep the sound down and one that could easily be modified or relocated, should the space grow again. At the front of the house, two full-service, multi-purpose restaurants could be used for fine and casual dining experiences, as well as a banquet hall for school board meetings. "This collaboration was extremely successful because we all had the same vision. Our vision was our students," Alma Charles, district director of career and tech eduction, said. Of all school projects, the team considered this project one of their greatest accomplishments. And how do their measure their success? By the success of their students. They are winning competitions left and right, not only because of their passionate instructors, but because of the space that facilitates the quality of the program. "We kept the students in mind throughout the planning process to better prepare them for the future and to build one of the best and one of the most state-of-the-art facilities that has been created," Kelly said.